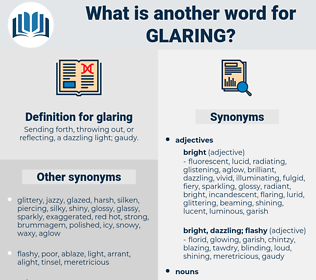 What is another word for glaring? Sending forth, throwing out, or reflecting, a dazzling light; gaudy. noticeable, eye-catching, outstanding, remarkable, manifest, stark, gross, compelling, resounding, poignant, dramatic, discernible, spectacular, tangible, high-profile, alarming, perceptible, marked, vivid, appreciable, pronounced, shocking, brazen, crying, undisguised, palpable, impressive, eloquent, distressing, distinct, clear-cut, straightforward, pressing, unmistakable, sharp, bright, notorious, overwhelming, plain. demonstrating, highlighting, Sharpening, stressing, emphasizing, underlining, affecting, grinding, Expressing, exhibits, beating, saying, Slapping, Occurring, Committing, knocking, focusing, hitting. striking, evident, visible, noteworthy, salient, notable, demonstrable, distinctive. mild, clean, plain, moral, obscure, dull, dark, inconspicuous, unnoticeable, unclear, vague, ambiguous. imperceptible, hidden, concealed, impalpable, insignificant, occult, unthought-of, trivial, small, latent, slight, secret, unknown, impenetrable, inconsiderable, inconsequential, undiscovered, trifling, unseen, covert, unimagined. But he did not tremble like the poor little lonely figure waiting in the darkness with eyes fixed upon those two dazzling, glaring eyes. This gave us a fair start of the crowd, but it didn't give us any time to argue with Foe, who still stood glaring up at Farrell, ready to put in another retort as soon as he could get a hearing.